Man From Below Manifesto Launch Video! During the event I will be giving readings, lectures, demonstrations and free advice as well as distributing newspapers. I really hope that you can make it. I will also be offering free water that I have sourced from an unknown spring 30 feet below the Thames Gateway. 12. This underground future is happening right now at my underground base in the Thames Gateway - come and join me right now and help to make this new future a reality for the whole world. Hi - I have just made some new plans to improve transport for our underground community. I am planning to take over the Woolwich Foot Tunnel by force in the next few weeks. I plan to brick it up at both ends and then dig down so that it joins up with some of my other tunnels and it allows us to all safely travel under the thames from our homes without having to expose ourselves to the surface. I am planning to adopt and adapt many other existing tunnels over the next few months in order to speed things up and repurpose these for our transport system. 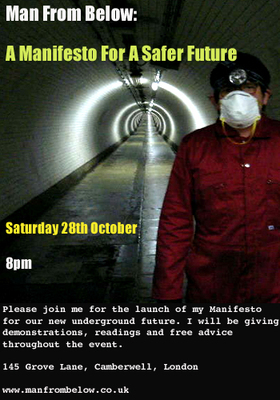 Please let me know if you are available to come and help me take over Woolwich foot tunnel. I've been testing plants on the surface over the last few weeks as I noticed that every 'natural' thing that I ate has been making me sik. My findings have themselves been sickening. Every single plant that I've tested has been filled to the brim with insecticides, pesticides, fungicides, growth hornmones and multiple unknown chemical combinations - in short I have deduced that all plants on the surface even those deemed to be organic are VERY poisenous. The only way for us to move forward safely is to now grow our own new plants below the surface in our underground world in a controlled and un-polluted envrionment. We will then eat from these plants and little by little we need to replace every plant on the surface with ones that we've grown ourselves. I have found a way of getting hold of seeds that are over 500 years old from here. These seeds are what we can trust for a safer future - they are bound to be ok and unpolluted. So please start working on this project with me right now and start growing some old seeds so that we can re-plant the whole surface as fast as possible.